I haven’t felt this accomplished in a long time. 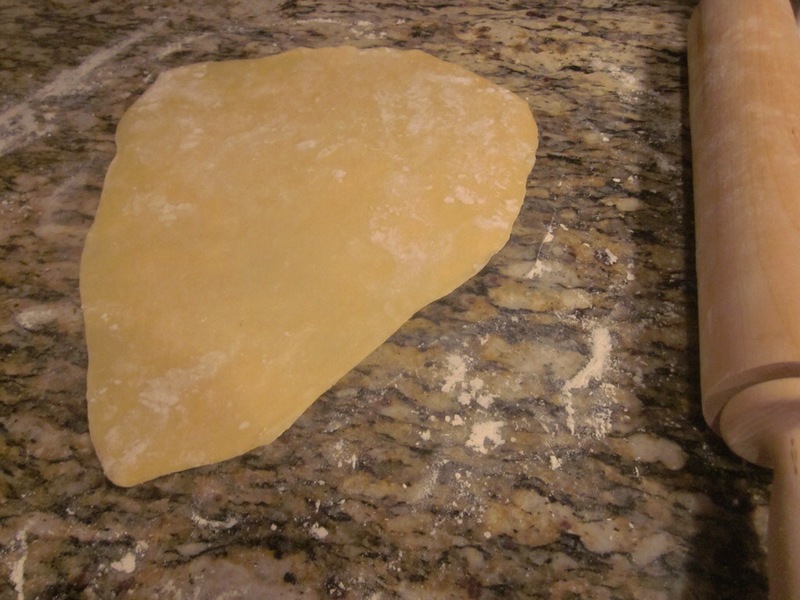 I mean, there was college graduation, accepting my first real job, and that time I made pasta… from scratch. That whole no-box-noodle thing just happened. That’s what this is about. You probably figured that out by now. This experience just goes to show you how much we’re controlled by convenience. I don’t have a pasta machine. That’s why I never made it from scratch. Can you believe it? I let that hold me back. A machine or just a hand-crank were on my wish list. And every time I went to share that wish, I thought, do I really need it? When will I actually make pasta? I mean, really make it. Don’t get me wrong. I eat spaghetti, Angel hair, penne, and rigatoni by the truckload. In her refrigerator, my grandmother always had a bowl of cooked spaghetti covered with plastic wrap and a bowl of her signature sauce (gravy is what she calls it). It was there when we needed… wanted… it. How easy is it to tear open a box of pasta, throw it into (salted) boiling water, and crack open a jar of sauce? Instant dinner. 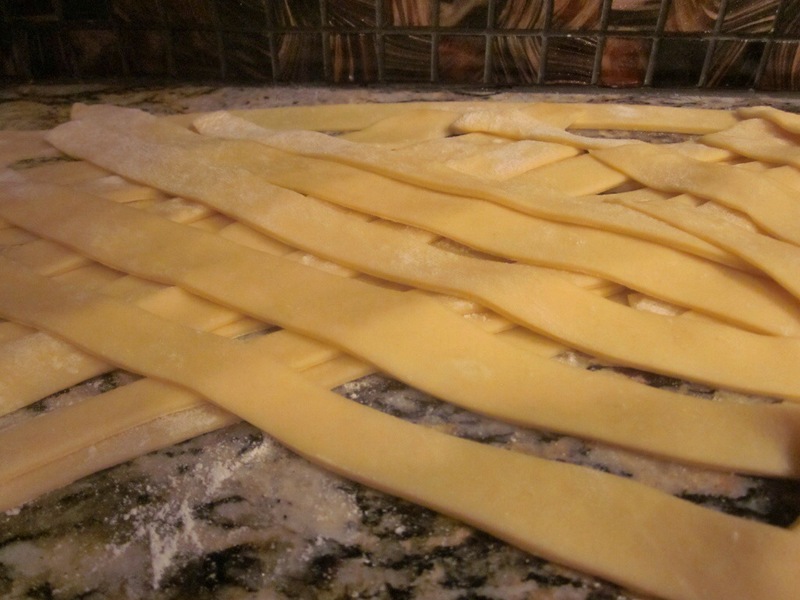 So again, why go through the pain of making dough and trying to turn it into perfect pasta? Because it’s possible, really not that hard, and completely magical. That’s why. When it comes down to it, pasta is just flour and water or eggs. That’s it. Really. It gets tricky when you start focusing on the flour. 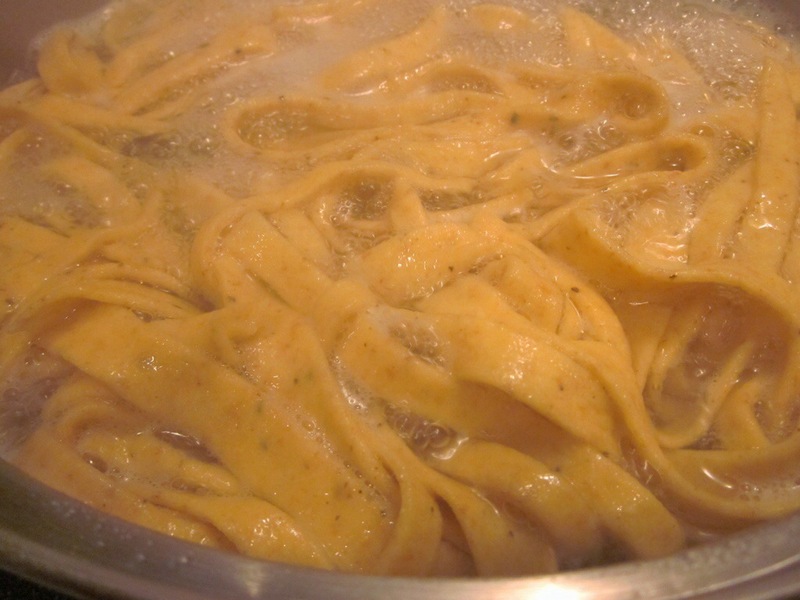 Traditionally, pasta is made with durum wheat semolina. That’s what gives it that signature yellow color (though egg yolks can help, too). It’s high in gluten, which means it’s strong and stands up well to drying and cooking. I agonized over the choice for days. I searched on the internet. I even sent Tweets to my favorite Food Network chefs. Alex Guarnaschelli Tweeted back and said to use 00. No stunt music needed. And don’t call the NRA. When talking about 00 in terms of pasta, it’s not a secret agent or a shotgun. It’s a type of flour, the kind purists use. It’s fine, soft flour. It’s also low in gluten, so it needs strength. In this case, eggs are used to bind it all together. It’s not a grocery-store staple. A lot of chefs use good ol’ all-purpose flour. There’s a good amount of gluten there and you likely have it in your pantry, so why not? But, as you know, I don’t do anything the easy way. So, I kept looking. I finally settled on a recipe from my favorite celebrity chef, Giada DeLaurentiis. She combines all-purpose flour and cake flour. It’s brilliant. Cake flour is low in gluten, that’s why it’s used to make soft, light and airy cakes. When combined with all-purpose, cake flour makes for tender pasta. And because I like to make things really difficult, I tracked down durum wheat semolina (at Ingles) and made a pasta using that. 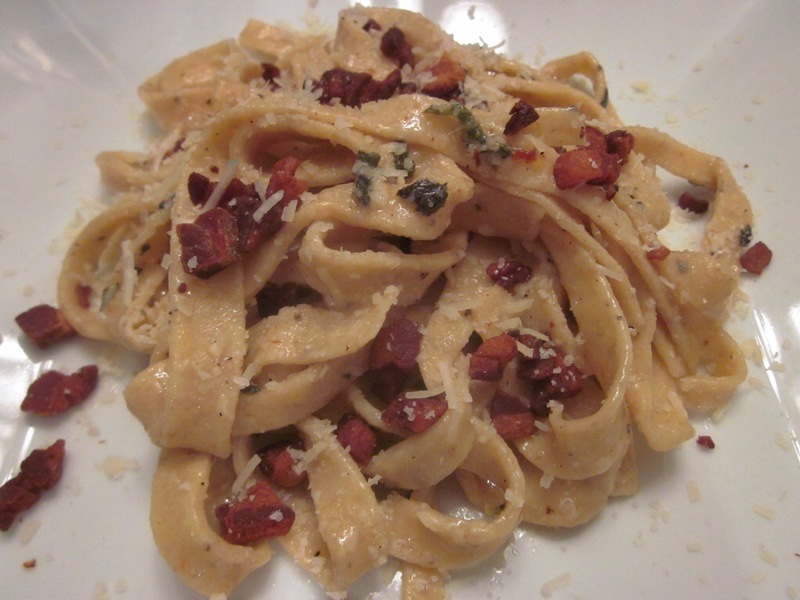 I based it off of David Lebovitz’s recipe. Instead of combining it with all-purpose, I combined it with whole wheat pastry flour (better for you, but still light – hence its use in pastries). 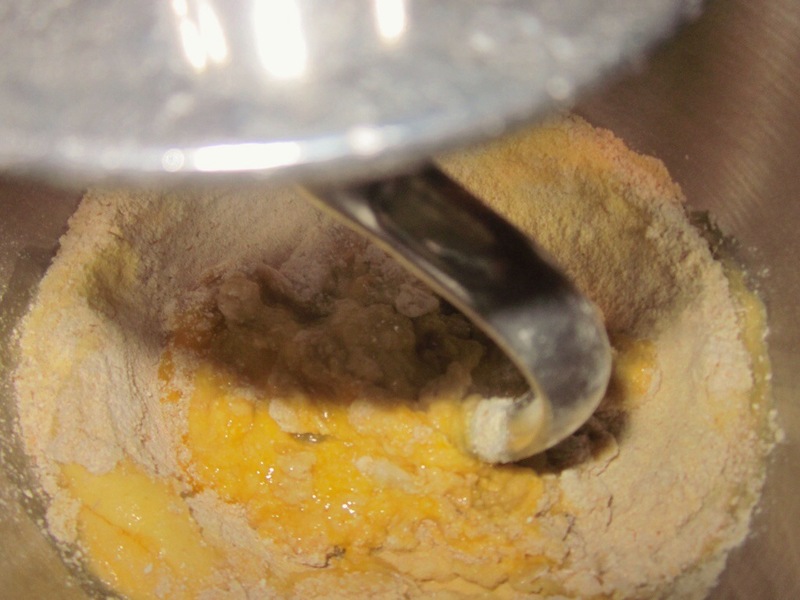 You add another flour to durum wheat semolina, because by itself it would be hell on Earth to roll out and handle. It makes a tough dough. I never did get that machine. But after searching the internet and YouTube, I learned that it’s really not that hard to make pasta completely by hand. Think about it. Do you think Mama You-Know-Who had a machine in her ancient Sicilian village? All you need is counter space (I realize that’s a hot commodity, especially in my kitchen), a rolling pin, and a knife or a pizza cutter. For my first batch, I followed Giada’s recipe. She calls for a food processor instead of the whole egg-in-a-flour-hole hand method. That makes it super easy. 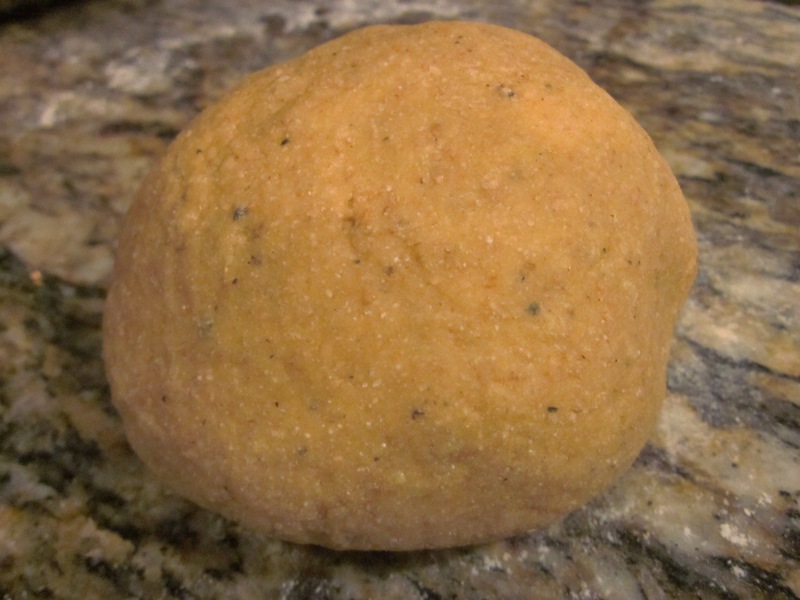 Ultimately, you get a ball of dough. Then wrap it and chill it. Then, cut it into fourths. 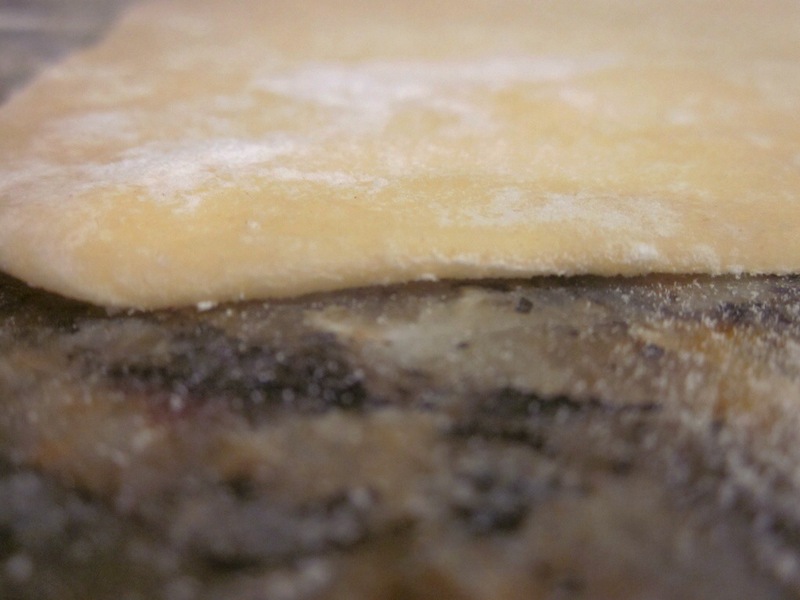 On a floured counter, roll out each fourth as thin as you can get it. You need a lot of flour to keep it from sticking to the counter and breaking. I’m not going to give you some crazy number like 1/8 in terms of thickness. Roll it till it looks thin enough to you. Beware though, the noodles will puff up just a tad as they cook. I promise you, this isn’t hard. When it’s rolled out, cut it into your desired width. I was craving wide noodles like papparadelle or tagliatelle. I used a pizza cutter, which made it super easy. 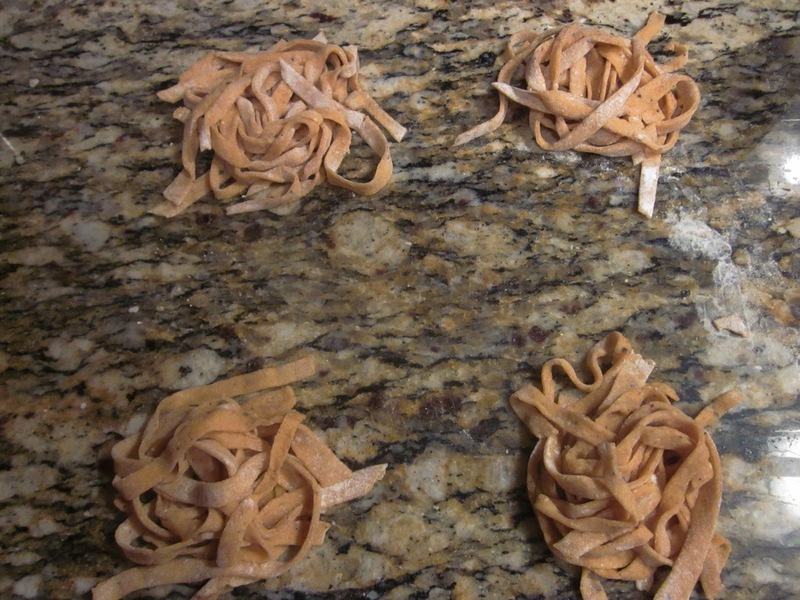 As you cut the noodles, move them to a pile. Mine didn’t stick because of all the flour. At this point, you could technically dry them and use them at a later date. 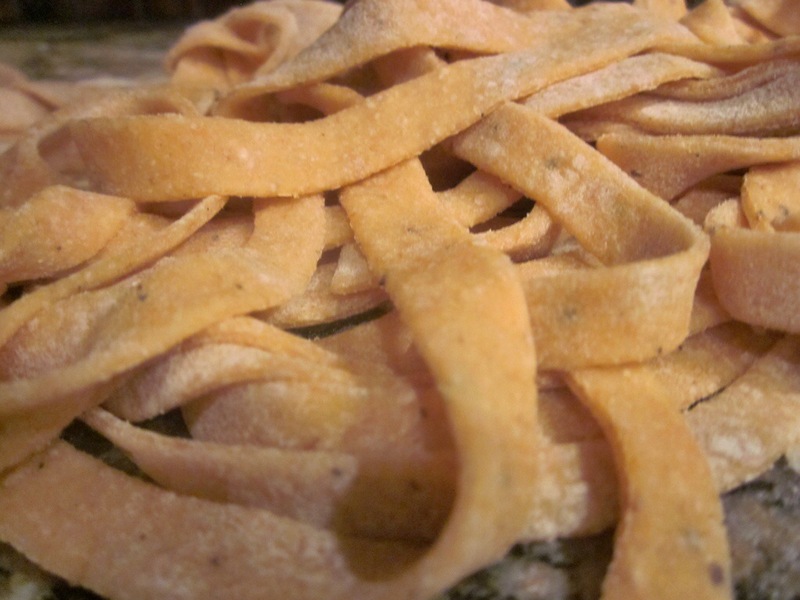 But to me, fresh pasta means fresh pasta. So I cooked it. 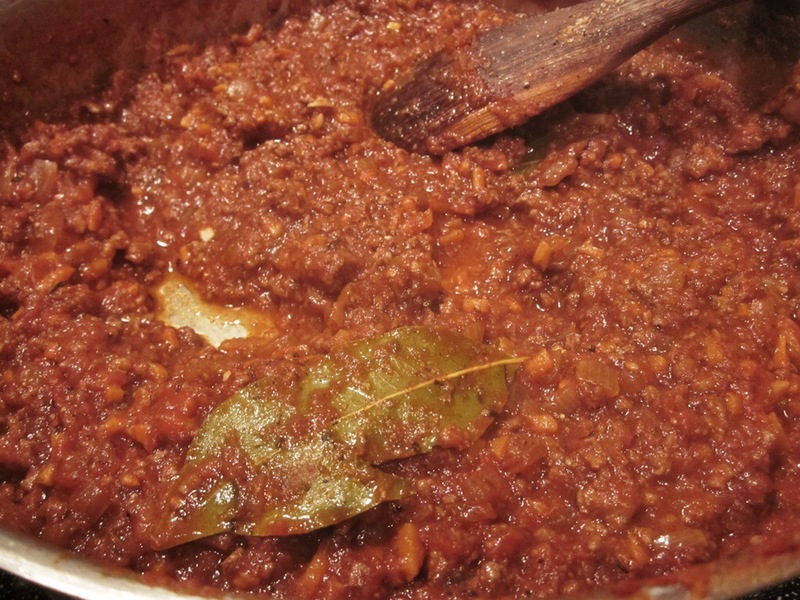 I made a Bolognese-style sauce for it. 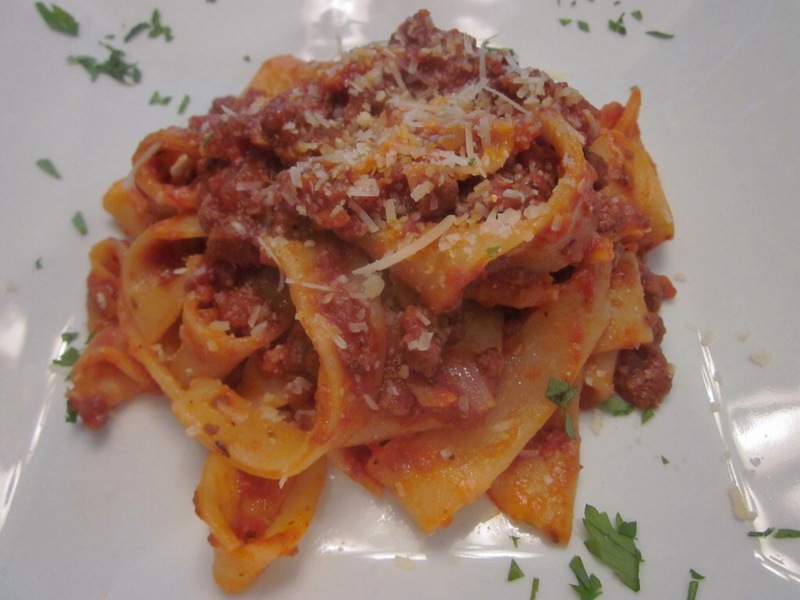 It was rich, meaty, and hearty, and stood up perfectly to the wider noodles. Boil water like you would for the boxed-batch, salt it heavily. I mean, like a handful of salt. This is your only chance to flavor the pasta. 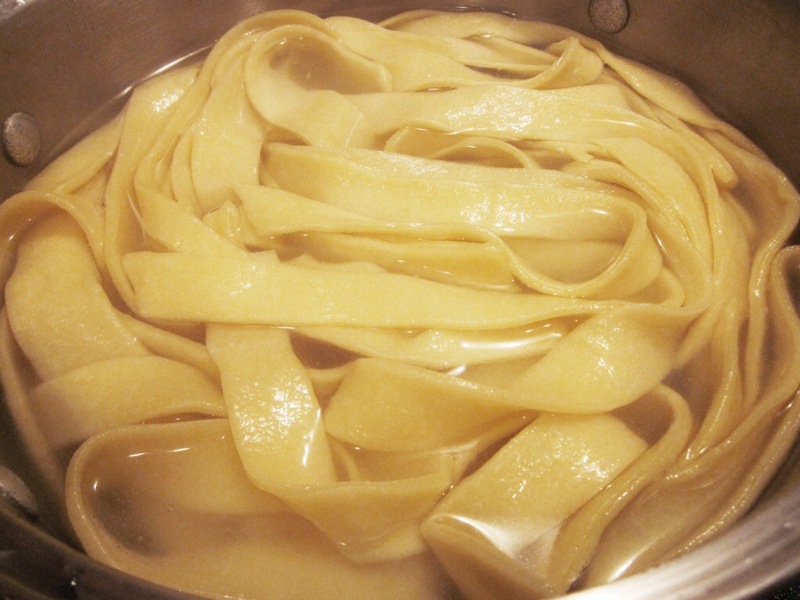 If you cook it in plain water, the pasta will be bland. 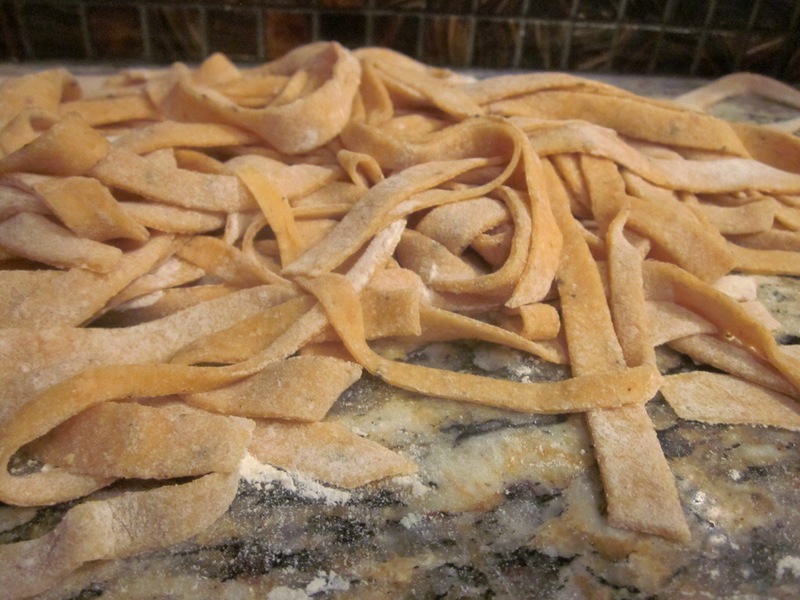 Fresh pasta only takes 3-4 minutes to cook. It’ll float when it’s done. Test a piece. 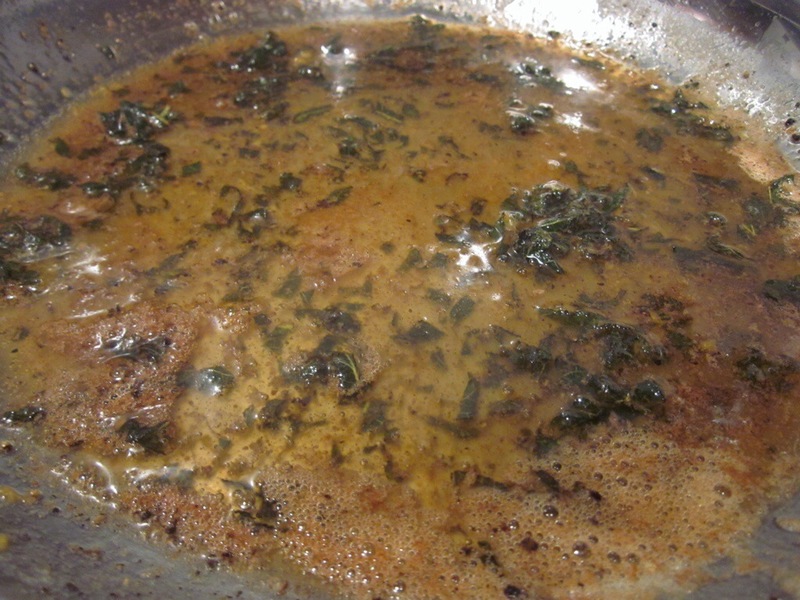 I added it to my pan of sauce, stirred it, and served it. With each bite of this dish, all my cares melted away. I didn’t even care that my counter looked like it belonged to a cocaine cartel or that the rolling pin was whining for mercy. The noodles were soft, but strong. To me, this recipe made something similar to a chicken noodle soup noodle. And to me, that’s a good thing. Pure comfort. For the second batch, I used this recipe, but substituted the whole wheat pastry flour for the all-purpose. You’ll notice that he calls for weights instead of cups. This gives you a more precise measurement. Spring for a kitchen scale. You won’t regret it. The semolina made for a very thick, coarse dough. It was a little harder to roll out, but not really a big deal. To be different, I added cracked pepper to the dough. 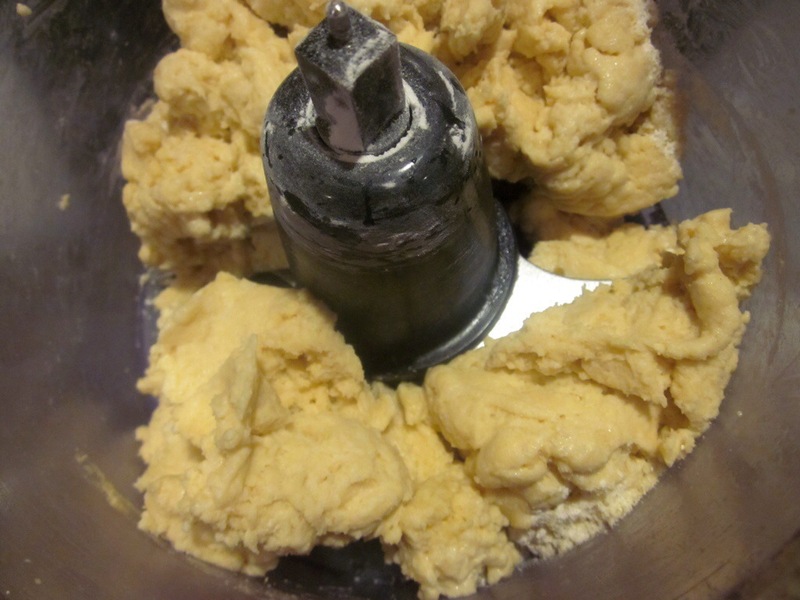 The recipe calls for the use of a stand mixer with a dough hook. 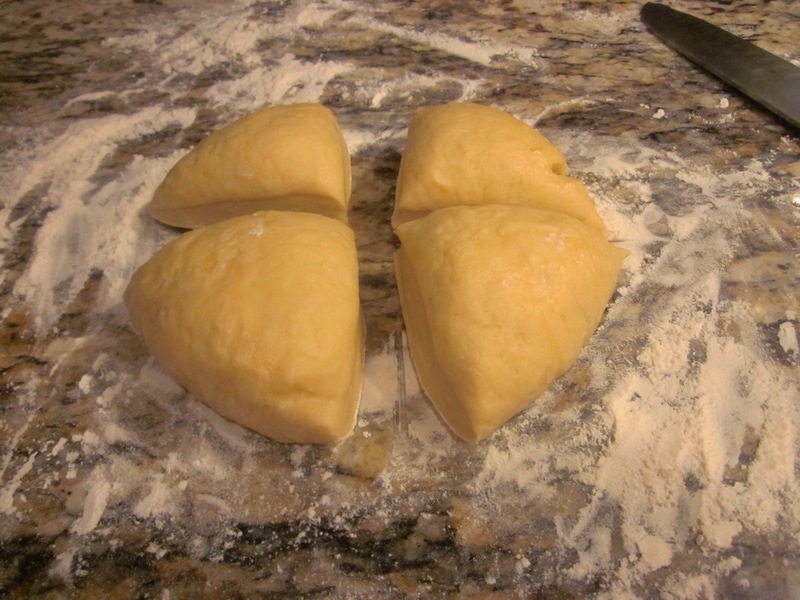 You also cut this dough into fourths. 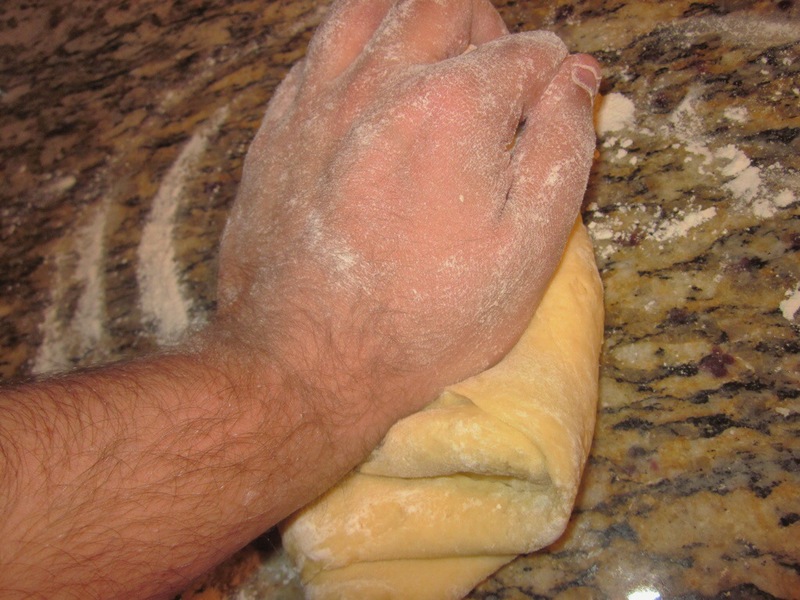 Flour your counter and roll out each fourth. Cut it into your desired width. This time, I went for more of a fettuccine style. To go with it, I made a sage and brown butter sauce with pancetta (Italian bacon – pork belly that’s been cured, but not smoked). I also cooked these noodles in heavily salted water for 3-5 minutes. Toss in the pan of butter, sprinkle with pancetta and serve. This is creamy and light. I know, hard to believe given that it’s buttery. I put just a touch of lemon in the sauce, and that helps a lot. 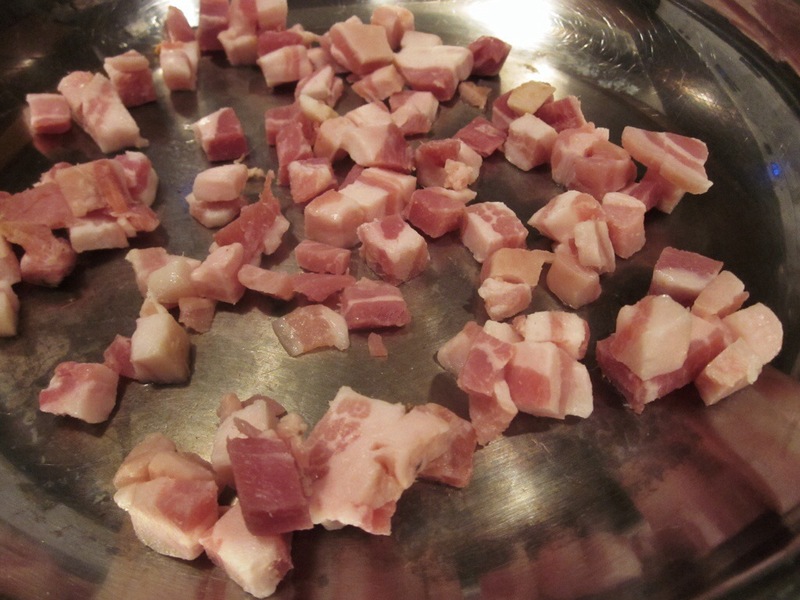 The pancetta is crunchy and salty. The noodles are slightly chewy, but still tender. They are heavier than the noodles from the first batch, all because of the semolina. That’s fine with me, though. Was the actual pasta better than the store-bought, boxed kind? I don’t think so. Did I enjoy it more? Absolutely. Making the pasta from scratch made me want to celebrate it. That’s why I made two different sauces from scratch. I made both batches the same day. One was for lunch, the other for dinner. It wasn’t tiring. It was a bit time-consuming. But technically, it all balanced itself out. It took a while to make the dough, but it took just a few minutes to cook it. 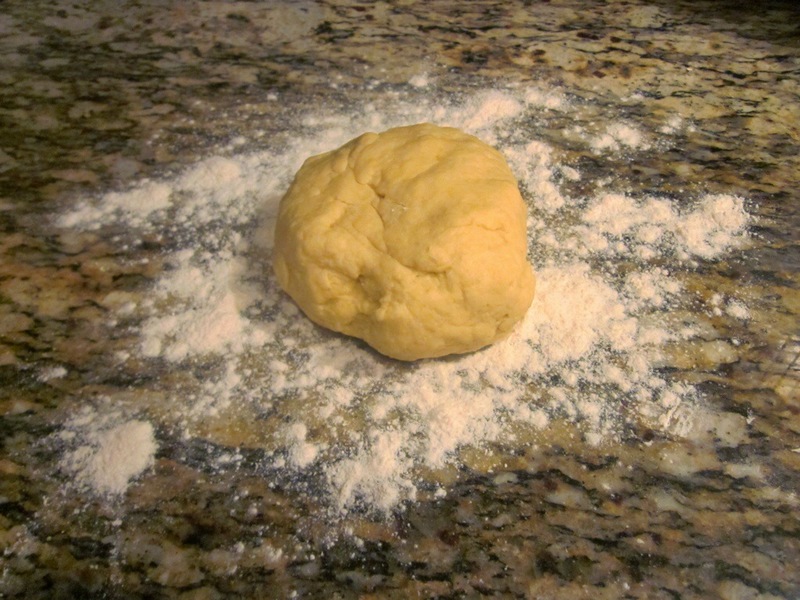 Make your sauces while the dough rests/chills. These meals just felt special. Will I do it often? No. Will I do it again? Yes, but probably for a special occasion or when friends or family come over for dinner. I definitely think there’s a wow factor to it. Maybe it’s just me, but I hope not. 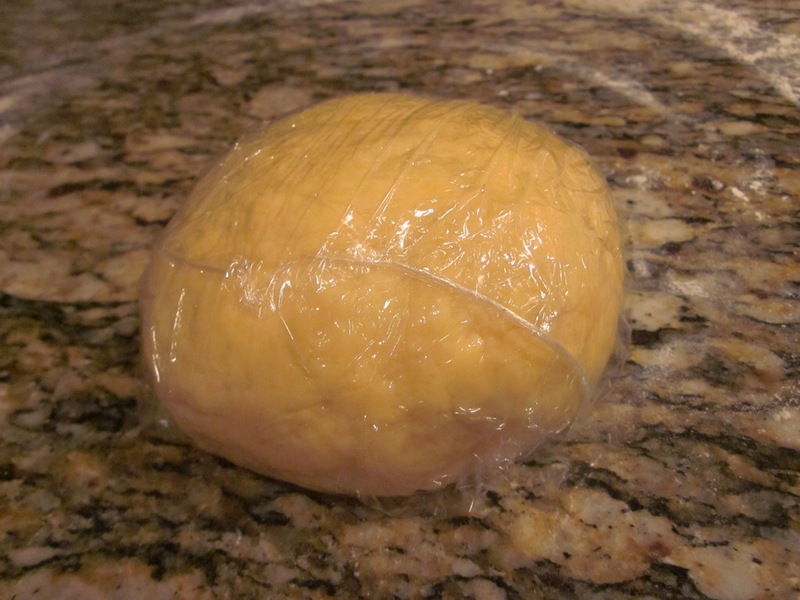 Tip #1: When making pasta from scratch, be sure to spring for the good cheese. I’m talking real Parmigiano-Reggiano. Promise me you won’t ever use the kind that comes from a green can. 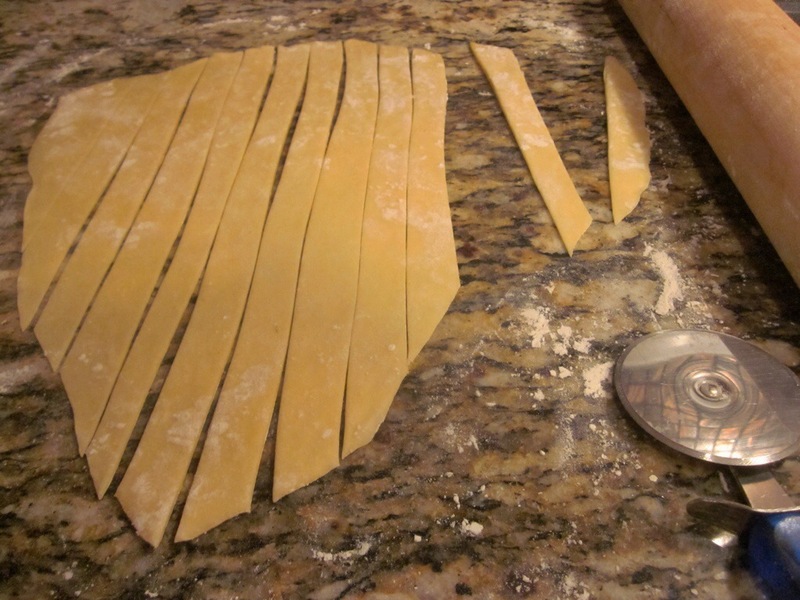 Tip #2: You can freeze the leftover fresh pasta. Just arrange into nests, put into resealable bags, and freeze. Bravo! It would have never occurred to me to make it without a machine. Wow! Is there anything you can’t make from scratch? Who do I need to contact to get you your own cooking show? Your instructions are flawless! !